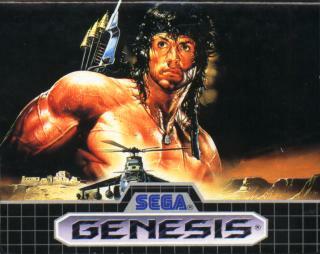 If you thought that the next game in the Rambo series might be something like "The White House Years," you'll find plenty of the famous Rambo action in this game. Codes 2 and 3 will give you infinite lives on the missions and in the bonus battles, always helpful. 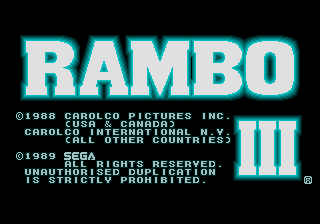 And since he uses up arrows and bombs pretty fast, you can give Rambo plenty to work with--just key in some of these other Game Genie(tm) codes, such as Codes 11 and 16. Codes 4 thru 7 allow you more lives. More than 5 will not be displayed properly on the options screen, but the codes still work. When using Codes 17 thru 23 to change the time limits on the missions, keep in mind that the secret agent will still tell you two minutes. 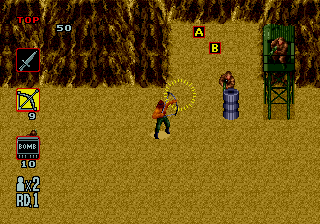 down Ikari Warriors style free-for-all and lots more fun. Watch for the cameo by the Thunder Blade 'copter! I thought this was a tough game. Fun, but tough. And 'First Blood' is one of the finest movies ever made about the Vietnam-experience for many veterans. It's not all blood and guts Rambo, it gets deep. This is a great game. 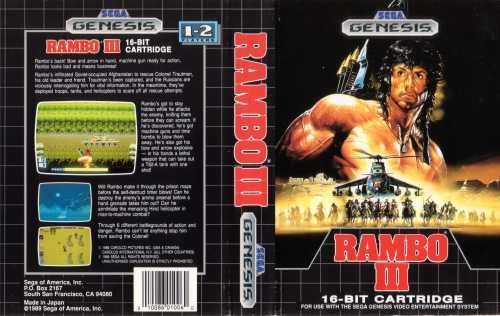 I only have the board as I ended up having the Japanese version (cart only) and no adaptor and therefore felt less guilty about smashing the case, I'm glad I did otherwise I would be still waiting to play one of my fave ever games.